At the bottom of each lyric is copyright and contact information for the publisher of that song. All Woody Guthrie materials are copyright. 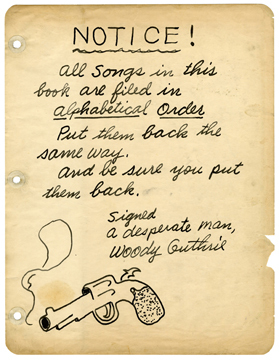 Please click here if you are interested in licensing Woody Guthrie materials. The following is a alphabetical listing of published and recorded lyrics. In most cases Woody's stylized spelling, punctuation, and grammar have been retained. Like the nasal twang in his singing voice, he meant it that way.